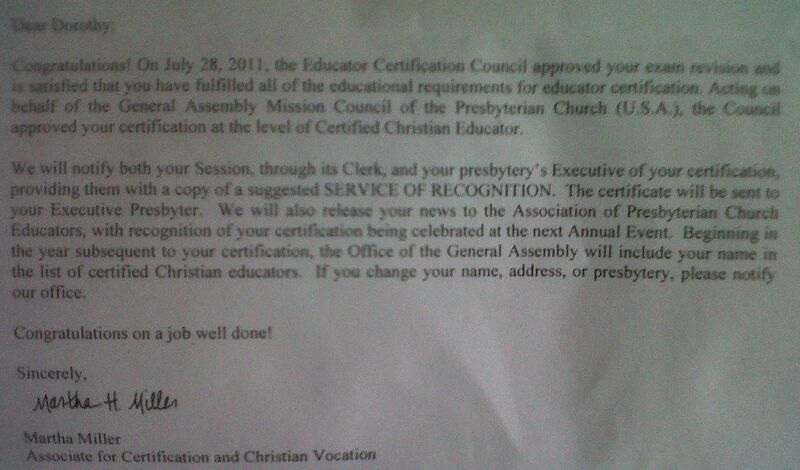 So, way back when…way back when I was a freshman at PC (1999), I heard of the Christian Educator Certification Process. 4) Work with mentor and reference group to make improvements to exam. 5) Send it off and say a prayer. I thought, hey that would be cool. So four years later when I went to seminary (2003), I made sure to take all of the courses I would need for certification. Then four years later (2007) after I had met the one-year-with-a-real-grown-up-church-job requirement, I sent in all of my paperwork and transcripts to make sure I had all of my ducks in a row. But I didn’t request my exam because I was also in the middle of the ordination process and also having a baby and sending a husband to medical school. And then our minister retired and the church let me to (w0)man the ship for a while until the first interim started. Finally, two more years later (2009), I decided I needed to request my exam before schooling was a too distant memory and I forgot how to write a paper. So in June 0f 2009, I got my exam with a deadline of December 2009 for completion. But in that 6 month time period, the first interim left and I had to (wo)man the ship for a while again until the second interim started and then also I got pregnant again and also the day care fiasco/switch took place. So at the beginning of December I was close to being done, but way too stressed out to finish, so I requested a month extension. But apparently they took much pity on me and my list of woes and gave me 6 more months to complete my exam. So a year later (June 2010), I mailed off 60ish pages of papers/lesson plans/exegesis to the Educator Jedi Council. But they only read exams twice a year, so mine wouldn’t get evaluated until October. In November of 2010, I got a letter stating that while most of my exam was super awesome sustained, I needed to edit one part and would have until February 2011 to complete my rewrite. I was not excited about having to rewrite that part, but I can’t really say that I blame them – that was the part I did last when I was just ready to get it done. But this is what I adore about the certification process versus the ordination process. For the ordination exams, if you fail a part, you have to wait 6 months and take that part all over again. With the certification process, you get helpful feedback on your original work and are giving the chance to improve upon what you’ve already done instead of starting all over from scratch. Leave it to the educators to show much more grace and encouragement. Who’s surprised? Not me. So I left the exam alone through the busy Advent season…and then we got our new minister (yet another fun transition, but this time a very good one)….and then on January 3, I found the football. So January was spent with doctors and February was spent on drugs…and neither was spent doing my rewrite. I embarrassedly sent another e-mail to the Jedi master requesting another month extension, and yet again they had much pity on my woe, and I was given three months. So in May 2011, I sent off my final rewrite. I had missed the deadline for the March reading, so I thought I wouldn’t hear again until October, but LO! and BEHOLD! I keep reading the letter over and over again to make sure I didn’t read it wrong. It’s very exciting to be “certified” nearly 12 years after I first set it as a goal….even if I was a bit “certifiable” along the process. Just last week (before I received the letter) I began considering getting my Doctor of Educational Ministry (DEdMin) beginning next fall when I’m on my sabbatical because I’m a glutton for punishment so ambitious. Hmmm…. Woo-hoo! I know it is difficult to decide to go that route and then all the obstacles in the way. I’m proud you stayed with it and didn’t just throw your hands up and walk away. Feels good, doesn’t it? So proud of you, as always, to reach this goal with everything else that has happened in your life since you first saw it as a possibility. So proud of you, dear friend!!! !